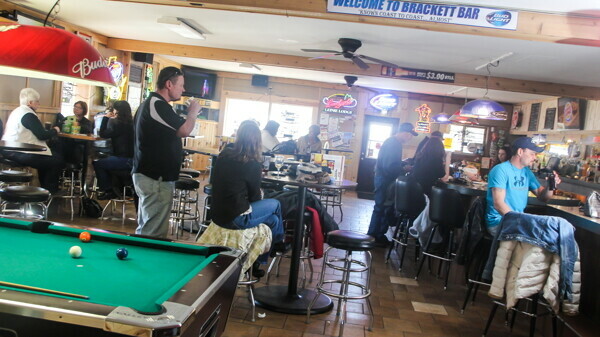 This classic Wisconsin tavern serves up delicious burgers, wings, and other staples. There are happy hour specials 3-6pm weekdays, plus five tap beers, free popcorn, late night grub menu, and a Friday night fish fry. A pavilion in the back is popular during the summer, and the bar offers men's and co-ed softball leagues. Pizza and and apps served after 10pm. This classic Wisconsin tavern serves up delicious burgers, wings, and other staples. There are happy hour specials 3-6pm weekdays, plus five tap beers, free popcorn, daily dinner specials, and a Friday night fish fry. A pavilion in the back is popular during the summer, and the bar offers men's and co-ed softball leagues.